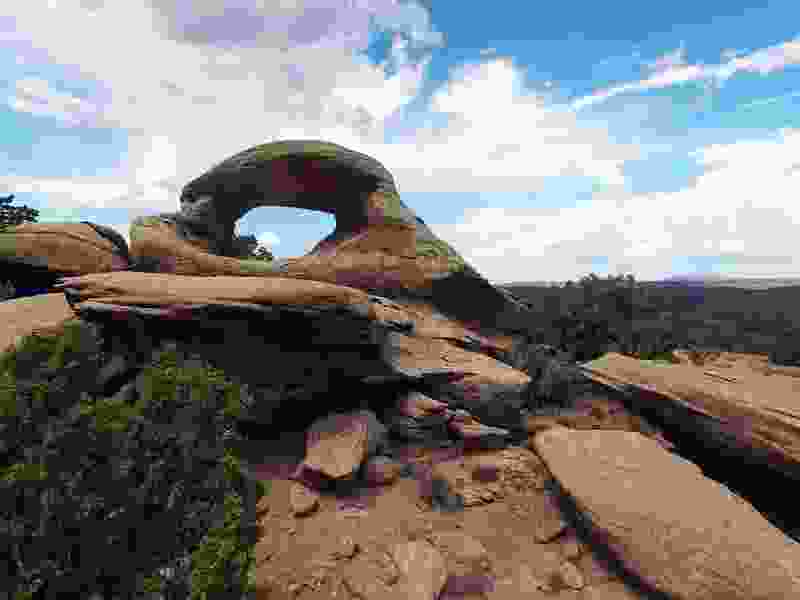 (Photo courtesy of University of Utah Geohazards Research) Pictured is Arch of the Sun in what was formerly Bears Ears National Monument. Trump came to Utah last December to sign an executive order shrinking Bears Ears (designated by former President Barack Obama after entreaties from tribal leaders and conservation groups) to 202,000 acres instead of the original 1.3 million. Grand Staircase was shaved into three different monuments totaling 1 million acres, down from the 1.9 million President Bill Clinton named in 1996. Those moves were swiftly met with legal challenges from environmental groups and tribes that say Trump didn’t have the authority to diminish the monuments' footprint. The cases will be heard in D.C. court after a federal judge in September denied the government’s effort to move the cases to Salt Lake City. The Utah federal court could have been more favorable to the government’s case while the federal court in Washington is likely a better venue for the plaintiffs. Wilson, the Salt Lake County councilwoman, told The Salt Lake Tribune on Monday that she signed onto the briefs because she thinks it’s in the best interest of the state to reinstate the original monument boundaries and because she believes the Trump administration short-circuited dialogue with Utah’s indigenous tribes. As a candidate for U.S. Senate against Republican Mitt Romney, Wilson called for a reversal of the boundary reductions. And though she lost her bid for that seat, she expressed hope that Utah’s majority-Republican congressional delegation will work to find compromise and form a legislative solution to the land dispute. One of the primary objections raised by opponents to the monument shrinkage was that the Interior Department, which manages the lands, would approve mining or drilling operations on land that was once protected. The Utah officials also raised concerns that interpretations of the Antiquities Act that would allow presidents to revoke national monuments would destabilize a precedent and system that has existed since 1906. “For decades, the federal government has understood the President’s authority under the Antiquities Act to act as a one-way ratchet: the President may designate a national monument, but may not shrink or rescind it,” the filings say. Advocates for the monument downsizing have argued presidents should set aside in monuments only the smallest area necessary to protect important resources. And Interior Secretary Ryan Zinke has said the administration is on firm legal footing to change the boundaries, noting other monuments have been changed 10 times in the past. The briefs from Utah’s local officials join seven others from members of Congress, the National Congress of American Indians, state attorneys general, legal scholars, archaeologists, members of the Outdoor Alliance and the National Park Conservation Association.